I know this subject is taboo but, I am looking for what people are experiencing in fuel burn rates. Everyone always talks about how many factors there are and how difficult it is to determine so... what is YOUR experience? If you were to take the boat out and cruise for 1 hour, how many gallons of gas would your boat burn? what engine are you running? what’s does your boat weigh roughly? Mostly interested in hearing about 16+ heavier boats with big blocks or LS engines... I ask guys this all the time and it never seems like I can get straight answers. Thanks guys. ak375hh wrote: I know this subject is taboo but, I am looking for what people are experiencing in fuel burn rates. Everyone always talks about how many factors there are and how difficult it is to determine so... what is YOUR experience? If you were to take the boat out and cruise for 1 hour, how many gallons of gas would your boat burn? what engine are you running? what’s does your boat weigh roughly? Mostly interested in hearing about 16+ heavier boats with big blocks or LS engines... I ask guys this all the time and it never seems like I can get straight answers. Thanks guys. There to many variables. Boat weight, depth, pro pitch, very hard to get hard number. 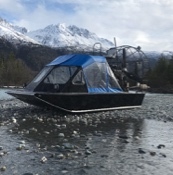 Now my boat 16ft Alaska air I burn 8 gallons an hour. Or by distance I can run to Knik glacier and back to bridge on 20 gallons. Deskha to flat horn lake 16 gallons down 25 back. I pay more attention to how far I can run than fuel burn. Right now I have 5.7 marine power. This spring I’ll have lsa 550hp. Which I should be able to burn less fuel. There to many variables. Boat weight, depth, pro pitch, condition of your bottom plays big parts very hard to get hard number. Pretty good feedback though! Thanks. Yes there are variables but “in general” or “average” is all I’m looking for. 1 mph on ground hauling a load and 2 mpg on river commuting, in deep water and fast current. 502 BBC, 4500# boat, 18' Alumatech w/5 person cab. It's all about comfort and the ultimate hunting platform for Alaska. 502 BBC on a 18' Alumitech 2.68 Stinger box, w/84" 4 blade Whisper Tip Whirlwind blades. I get about 3 MPG. I measure this each trip with a GPS. Boat weighs about 2,000 lbs with no gear, gas, or passengers. Running stroked LS3 with Holley EFI turning a 4 blade R thru a 2.88 Ox Box. I run a 16’ alumitech with a 502bbc. Get roughly 2.5mpg at a 3000 rpm cruise. (30-32mph) Best guesstimate boat weights around 3k with out gear. I run a 15' GTO Open Aluminum hull with trolling motor and 4 batteries. fairly heavy rig. 383 stroker with 2.09 Stinger box with Sensenich super-wide. When cruising with me and 3 passengers on board, I burn on average 8 gallons per hour, or about 3 mpg. If idling around frogging, I burn 2 gallons per hour. My little 12' boat weighs around 700 pounds I figure, if I keep it in skinny water and keep my foot out of it she sips fuel. I logged almost 65 miles in one day, burned around 10 or 11 gallons. And that was some dry running and quite a bit of deep water too. Cruise at around 1800 in deep water, about 30 mph.